SCRUM & Planning2 – HOW will we do this? SCRUM Planning2: Architecting the unknown – The HOW. In SCRUM Planning2 the focus is entirely on the team identifying the HOW of the WHAT being introduced by the product owner during the course of Planning1. In Planning1 the product owner described WHAT the user stories actually contain and WHAT the result of the finished stories should look like. Now the team has the challenge to discuss HOW this user story should be implemented. Planning2 is really essential to the team to discuss, plan, architect, argue and agree on how the business user story should be implemented in software. Both, Planning1 and Planning2 are essential activities for the team to finally commit to what they plan to deliver within this sprint iteration. In our company, we had user stories where individual software developers were sitting days and days to solve one huge technological question. Before entering Planning2 we still were at one user story worth around 40 story points. During Planning2 the whole team came together and discussed the findings of the individual software developers. And magically, they came to a solution – valued 8 story points – implemented during this one sprint and delivered as commited. The miracle of communication! Planning2 – in essence – reserves real quality time for the team to think through the challenges of the user stories. Allow time to discuss, to argue, to joke, to de-focus, to be creative. A good result of Planning2 is a whiteboard full of tasks associated with the user stories. Ideally, the whiteboard contains a collection of tasks being identified during the discussions in Planning2. 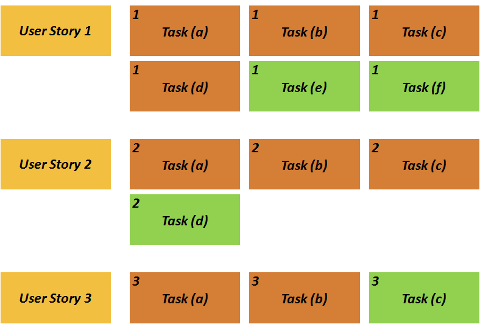 The sum of the tasks finally deliver the user story – the associated business value. In our Planning2 sessions we introduced a color coding scheme to reflect the kind of work to be done. Green – for example – stands for quality assurance testing tasks. The more experienced the team, the better the team members know each other – and trust them – the more trustworhty actually the result of Planning2. When the team is finished with Planning2 they continue with the commitment. During commitment they discuss what user stories they are able and willing to commit. The commitment is “carved in stone”. The scrum master pushes the team to deliver their commitment and the product owner trusts on the team to actually deliver what they commited. The commitment is all about trust and honor. SCRUM Planning1: Well prepared Chaos – The WHAT. Goal of SCRUM Planning1 is to explain the team WHAT should be accomplished during the course of this sprint. In theory, the product owner has a well structured backlog (actually usually a spreadsheet 🙂 ) where you find user stories, estimated, already well thought-through, prioritized according to their business value and hence is very well prepared to guide the team through the SCRUM step 1 in the sprint – Planning1. Well, after 2 years of SCRUM, we are close to there – close to – not yet there. Initially, we had heavy struggles to get the company wide backlog setup at all. We had lots of stories in there ranging from small stories (1 to 13 story points) up to giant stories (estimated with 100 to ?) – but still in the backlog. We had stories in there with clear business value and others claimed to be “strategic”. We also had stories in there which weren’t good user stories at all (“Fixing the XYZ issue on technical element ABC”). So, we had all ingredients for a really bad Planning1 – and we had several of them. Some of them went to a point where people left the room – entirely agitated. The early days. Now, we have product owners being on top of their backlogs and user stories. Stories being estimated higher than 13 need to be broken down into smaller pieces. Why? Experience shows that stories estimated bigger than 13 are too complex to be estimated reliably. All stories need to be estimated. Why? The team needs to know what to be expected in the Planning1 session and the product owner is forced to think-through the whole story. One point which is still tricky is the actual metric to measure business value. For the time being it’s still a mixture of our VP Product discussing with the product owners – but at least it’s an identified way to prioritize the backlog. The product owner needs to be on top of his backlog (be it the company backlog or the team backlog). Stories need to be small enough to be understood fast and easy. The team needs to be involved as early as possible (pre-estimation ideally). You need a properly filled backlog and ideally you find a metric to measure business value in an objective way. SCRUM Sprints – The mechanics. SCRUM Sprints: One Sprint in a Live. The typical structure of SCRUM – the mechanics as I call them – are quite common. No big adaptations in the industry. I still want to go into the various elements to highlight the tiny little details we decided to change and where and why. The graphic actually shows the structure of our SCRUM mechanics.We have all typical elements: Planning1, Planning2, daily sprint stand-ups, estimations, review and retrospective. Since we’re developing software and came from a project / waterfallish work-model in the past we still have some actions for final release testing and the actual software release. The agile SCRUM team – bundled forces. Besides the key roles in SCRUM, there is still this unstructured collection of humans – the team. When we started to introduce SCRUM we simply put all developers into SCRUM teams and we were finished. Amazingly, this went quite well. Developers found themselves confronted with other tasks than pure coding – but as said they did well, accepted the responsibility, improved their intra-team communication skills and everything seemed fine. From a pure developer’s view the story could end here already. BUT (you knew there would be a “but”, right?) software development as such doesn’t contain only software development tasks – especially not in a web environment. How to treat the non-developer resources? What about architects, user experience, visual grafix, editors, system administrators, online marketeers, quality assurance? Are they part of the SCRUM team – or not? If not, how to get them to work together with the SCRUM team? We started to structure the team. Besides the developer we have a lead developer. This person actually leads the team from a technical perspective and acts as an architect for the team. Next to the developers we onboarded the quality assurance team members to let them work directly with the SCRUM team. In parallel, we put user experience specialists directly into the SCRUM team. The visual grafix persons are still external to the team and form a service center where multiple departments of the company got access to. Members of the editorial team participate in the daily stand-up meetings (well, most of them) – but are still not part of the SCRUM teams. The system administrators are associated to the various SCRUM teams we operate – but are not actually part of the team. Online marketeers? Other departments? They are also not part of the SCRUM team and communicate mainly with the product owners and scrum masters. Is it optimal? Well, not really – but SCRUM in our organization is a living process – we’re still improving! Initially, get the SCRUM team going with the product owner, scrum master, developers and quality assurance as team. In a next step when SCRUM is well accepted and adopted start thinking about a better structure for your teams. Project Manager? Not known in SCRUM books – hence no need for it?!?! SCRUM in books transports the idea of “You don’t need project managers any more”. Why is it so? Well, the roles in SCRUM books – product owner, SCRUM master, team – explicitly exclude a project manager. The product owner manages the backlog, prioritizes the stories and creates release plans. The SCRUM master “enforces” the mechanics of the process, organizes meetings and moderates them. The team takes over the detailed planning sessions and estimations. When we introduced SCRUM we really enjoyed getting rid of all all the structures and limitations of the project work. We arrived 100% in “agile”. During our SCRUM setup days we decided to move our “project managers” into “SCRUM master”. Now with their new very limited scope of “not breaking” the new process rules. All the other duties – gone! The new modell went all well until … we started our first epic. In waterfall days the epic was called project. After some time SCRUM works very well organizing the software development. Mainly because the process SCRUM isn’t that hard to apply and everybody likes it – because it’s agile and simple. But the overarching business planing – looking beyond the daily SCRUM work … we lost it almost entirely. Who does the prioritization work on which project – ahhh epic – we should work next? Is it the product owner? The VP product? The CEO? The whole management team? Who takes care of the resource conflicts arising automatically if you have scarce resources? Who detects those conflicts and escalates them? How do we deal with delays? Quite some questions. A lot of companies switching from traditional – thoroughly controlled processes to the agile modell encounter comparable issues, we learned. How did we solve it? Well, we started to recognize that SCRUM is only one piece of the jigsaw puzzle. Furthermore, you need to work on your agile organization. Not only product development and product management are customer of your SCRUM teams. A lot of topics – owned e.g. by online marketing or customer care center – need attention as well. In the end, when multiple departments within our organization are involved in work we started to include project managers again. They have an inter-department communication and coordination role. So, for us project managers did not disappear entirely, they showed up again in the context of strategic projects with a slightly different role. SCRUM and Management – helping or disturbing? At a time the product development chain went to an entire stop. At this point we decided to introduce a new method – SCRUM. We all recognized that the project-waterfallish style of delivering our daily work didn’t work out that well. So, the demand for a radical change was recognized at all levels in the company. We decided to move away from the old style (it was not even project-style work – it was … hmmmh hard to find a word for it) towards a new way of working – agile & SCRUM. The C-level took a decision to invest in consulting to help us implementing the fundament of our today’s daily work. So, management had quite a stake in the agile process. When the product owners started to discover their freedom to take decisions on the priorities of stories something really strange happened. We started to have some really bad situations where a whole process came to a halt due to non-informed executives. Who decided to take this story before the other story? Why wasn’t management involved in this decision? Well, some of these decisions had real impact on our business (the product owners couldn’t oversee at this time). Other decisions turned out to have almost no impact no our business. But where is the borderline? How to handle these situations in an agile organization? What’s the role of SCRUM? We took the situation to one extreme: we introduced the – I call it – “Everybody-into-one-room-prioritization”-meeting. We got all stakeholders from our departements into one room and did the prioritization of stories. At this stage, the one who was able to out-shout the others had the prioritiy secured for their stories. We haven’t had an objective way to do business value determination and hence persons being able to express themselves in a convincing way were always higher prioritized. We weren’t overly successful with this method and decided to empower our product owners. They met in a “backlog meeting” and got the prioritization of the story items right. At this time we still believed in the one-and-only instance of a company backlog. Nowaydays, we moved away from the single-instance company backlog and have topic-bound teams and team-bound backlogs. Paired with empowered and more confident product owners – it seems to work. Trust them and don’t start micro-management. That’s simply said: frustrating for everybody! When to use waterfall, when agile? Design Thinking in a nutshell – what is it and what’s in for us? When to use waterfall, when agile? - in agile-mindsagile-minds on Agile defined.